Students may grant a third party (i.e. parent) access to certain features within PASS. These instructions document the process through PASS. Guest access may also be managed through PASS Express. PASS is accessible from the PASS landing page: https://campus.uwplatt.edu/its/pass. Notifications - Guests will receive an e-mail when added or when access is changed. Students will also receive an e-mail notification when access is granted or when access is changed. Guests will receive a different notification if all access is revoked. 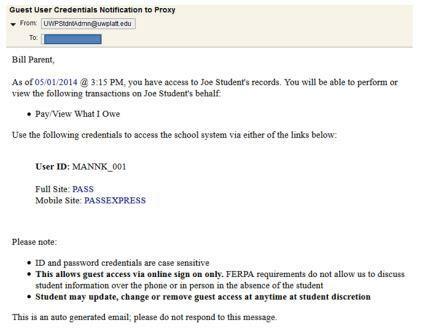 Students will receive an e-mail confirmation when all of a guest's access has been revoked. If your guest forgets, does not receive, or the password is not working you can resend a new password at anytime. Simply select the guest user you want to resend the password too, click the "Resend Email Notification" button. A new email will be sent to the guest containing what access they have, their username and a new password.